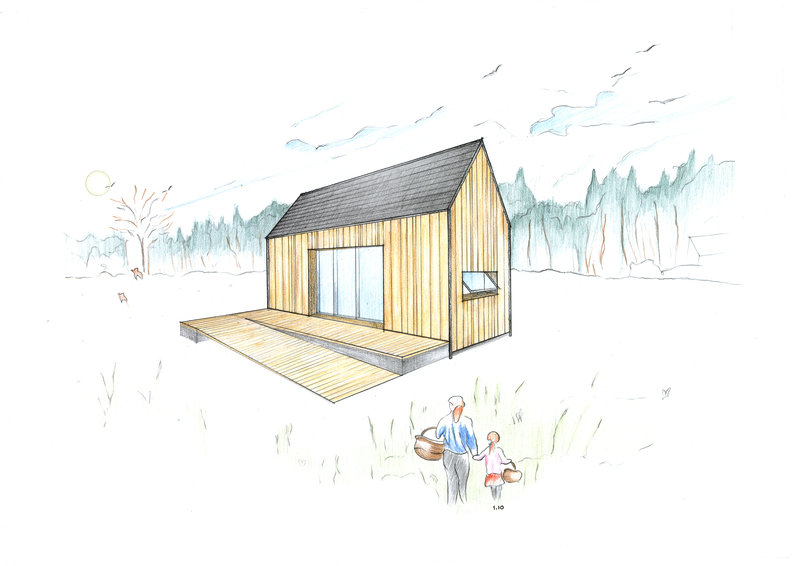 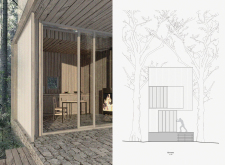 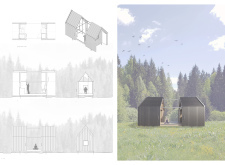 The competition seeks eco-friendly and cost-effective proposals for an easily- constructible and -replicable 15m² hut that could be sited in a series of forested locations across the Ozolini farm. 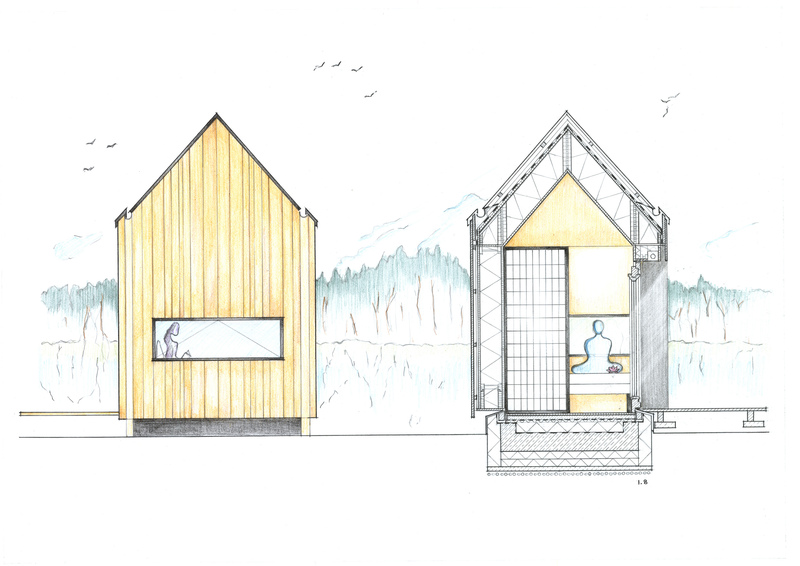 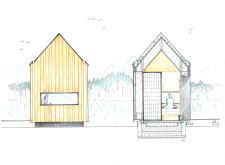 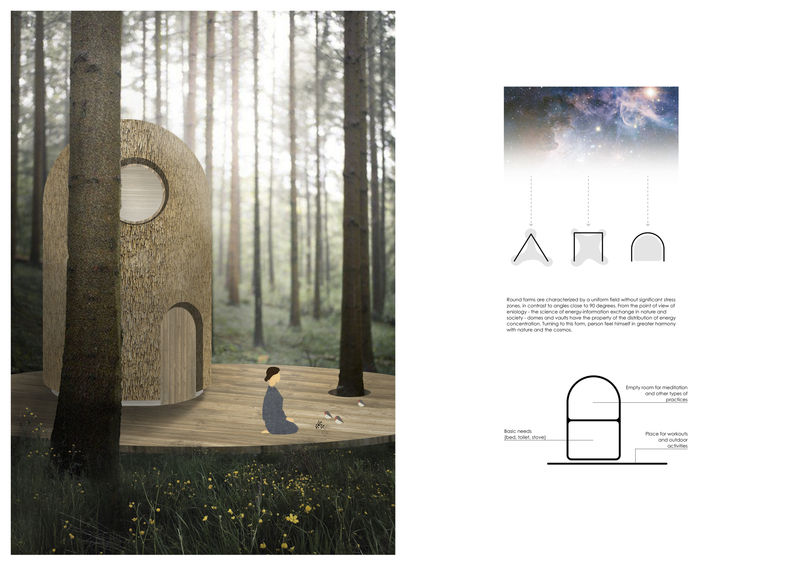 The cabins are intended to provide users which a calm space to meditate while surrounded by the sounds of nature. 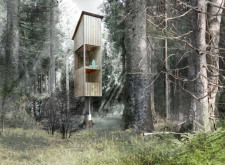 Latvia is over 50 percent forested and home to a diverse ecosystem, which includes rare black storks, otters, beavers, lynx, wolves, deer, wild boar, elk, and red fox. 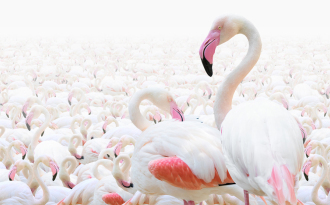 Protected wildlife zones account for approximately a fifth of the country. 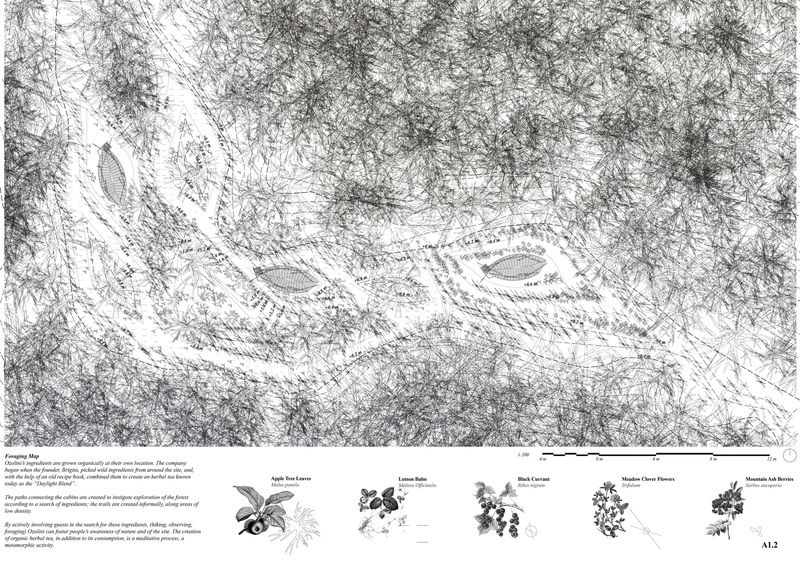 The Ozolini estate is dense in natural resources, with as many as 50 species of herbal plant life per square metre. 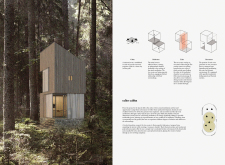 It is located 100 km from Riga, Latvia, immersed in the forest and alongside Lake Bezdibenė. 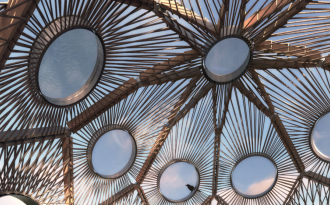 Ozolini, in addition to functioning as a tea farm, hosts summer camps to explore the secrets of medicinal herbs, as well as self-awareness workshops. 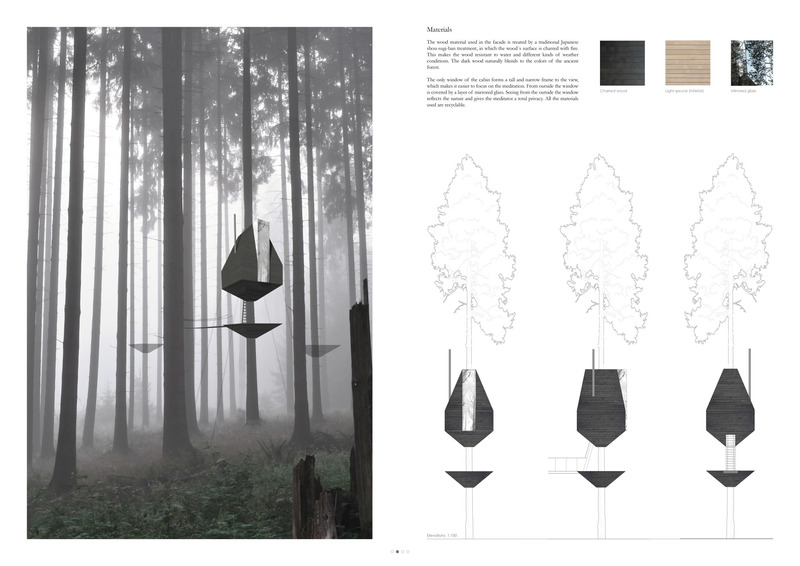 Designs were judged for their integration within the forest and sensitivity to the environment. 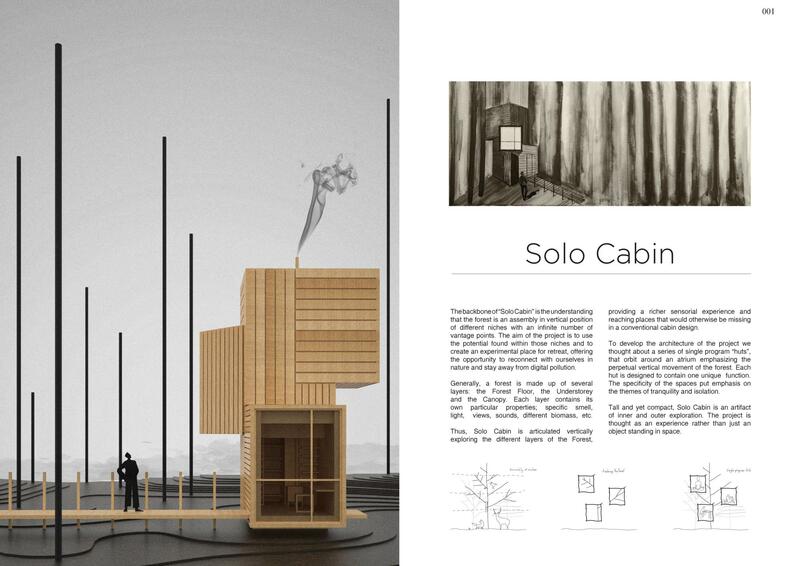 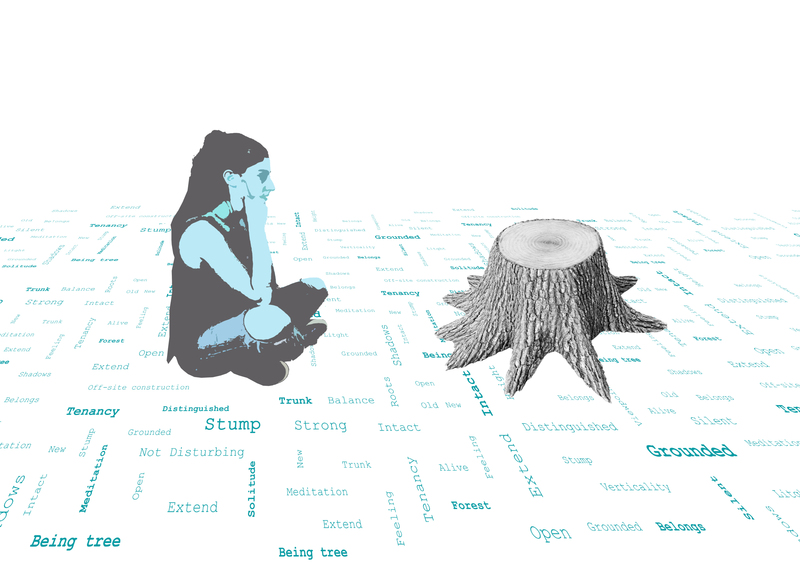 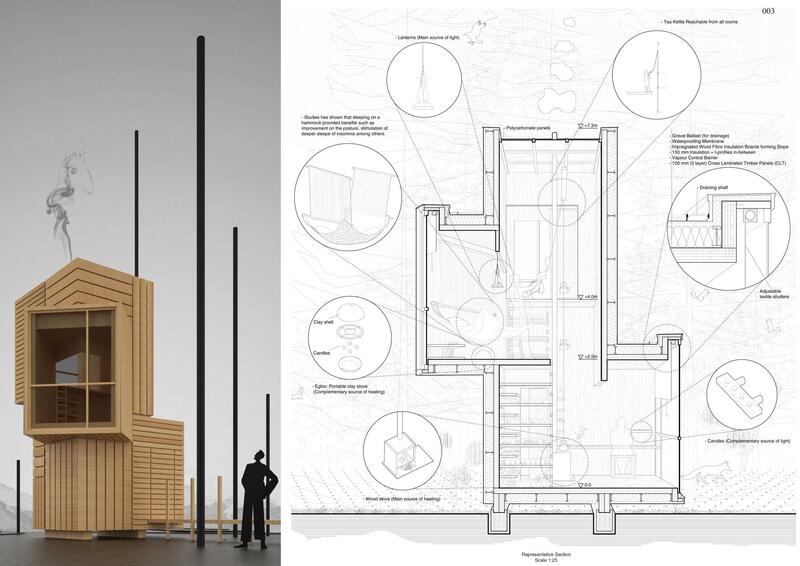 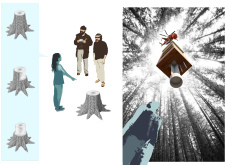 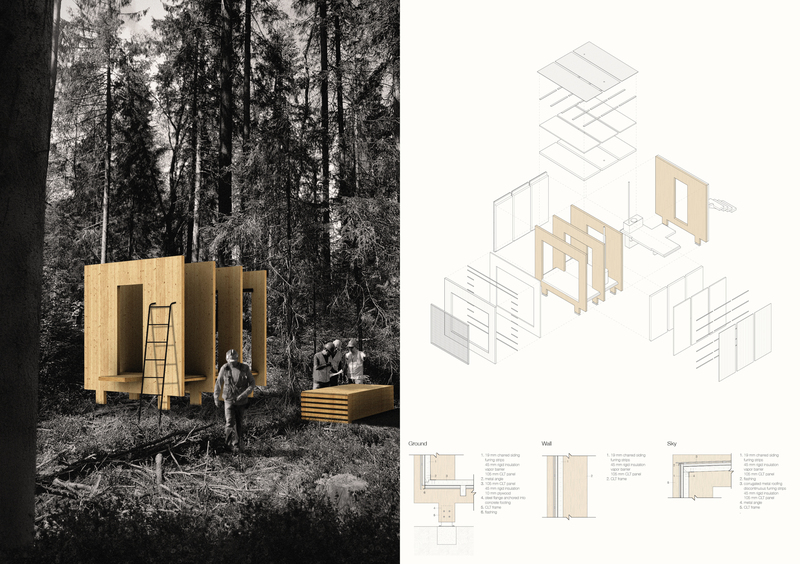 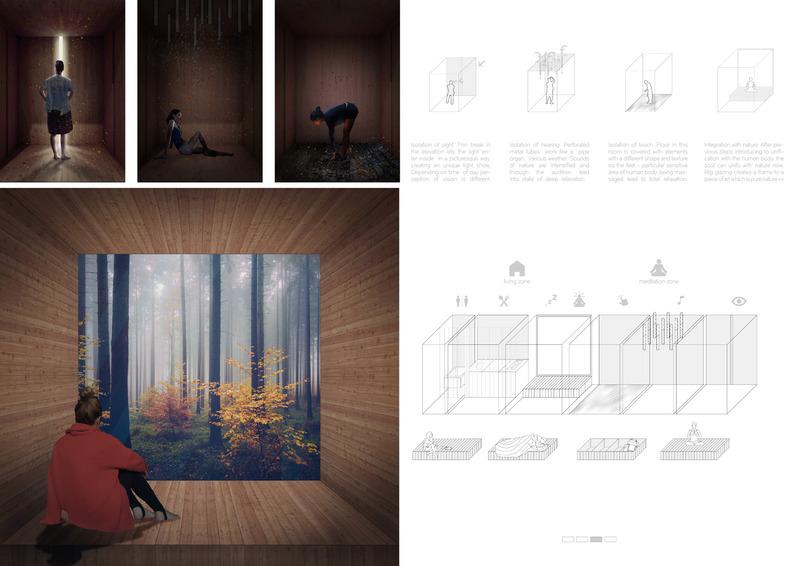 A range of ideas were submitted for cabins that have the capacity to interact with the forest in a variety of ways. 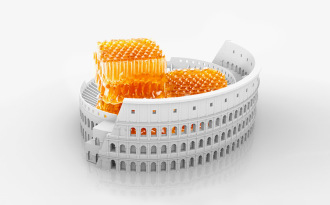 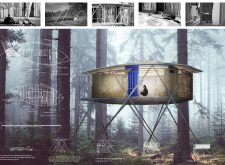 The jury asked: Has the design introduced some innovative architectural idea? 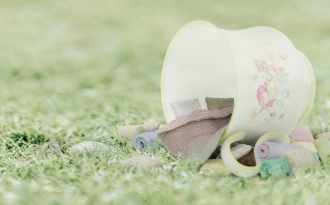 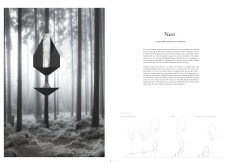 How has the designer made use of this particular site? 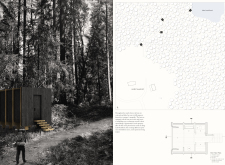 Does the proposal offer a peaceful space to observe the forest, and to be both completely alone and protected from the elements? 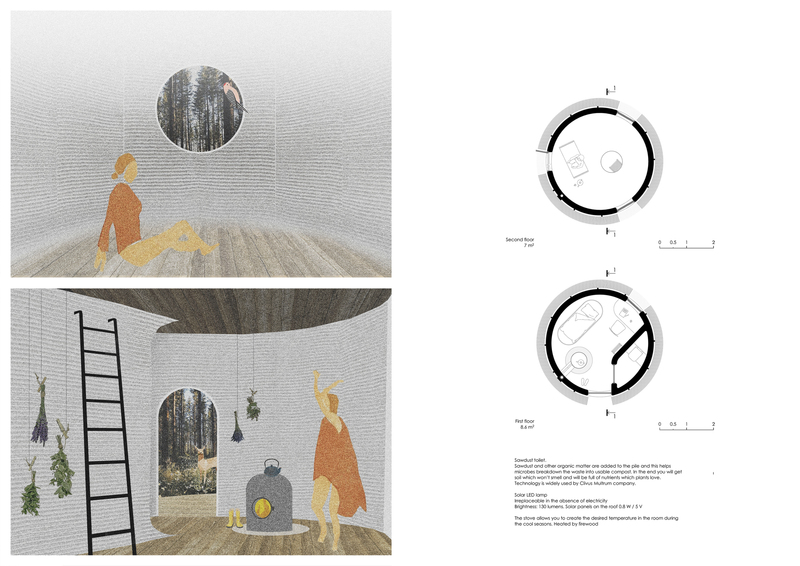 This competition is part of a series organised by Bee Breeders focused on designs for compact living spaces integrated within nature. 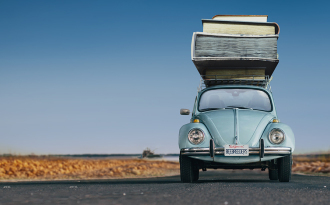 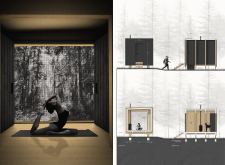 Recently, the website ran competitions seeking proposals for Iceland Northern Lights Rooms, European Velo Stops, and Amber Road Trekking Cabins. 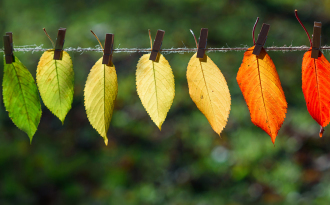 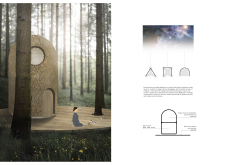 Bee Breeders would like to thank all entrants for their participation in the Silent Meditation Forest Cabins competition. 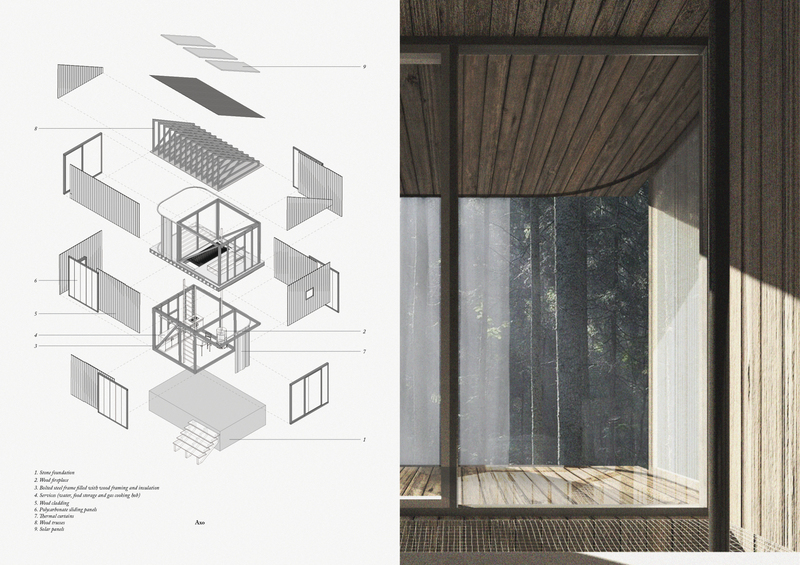 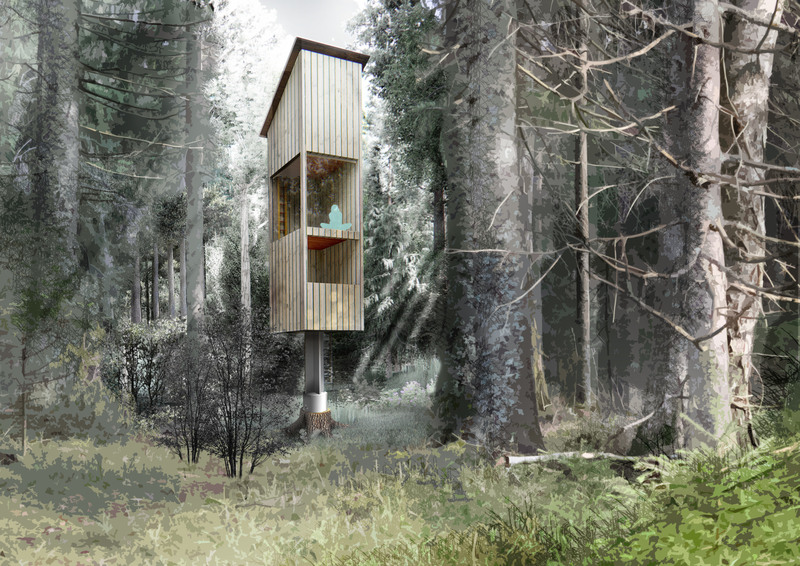 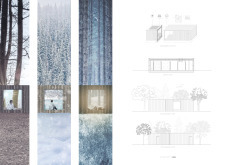 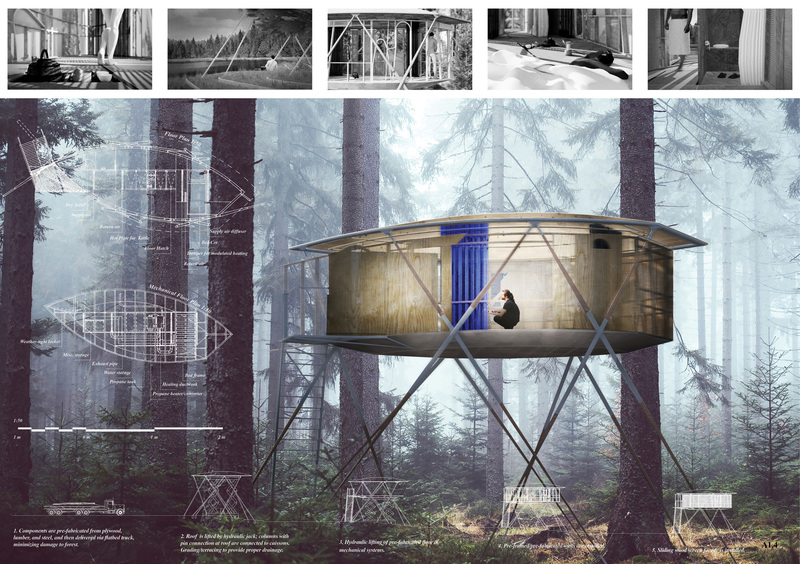 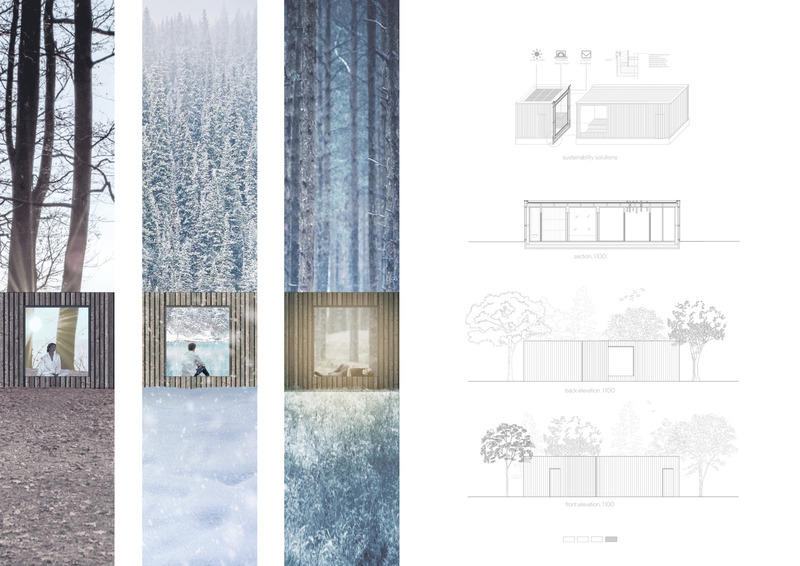 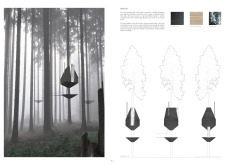 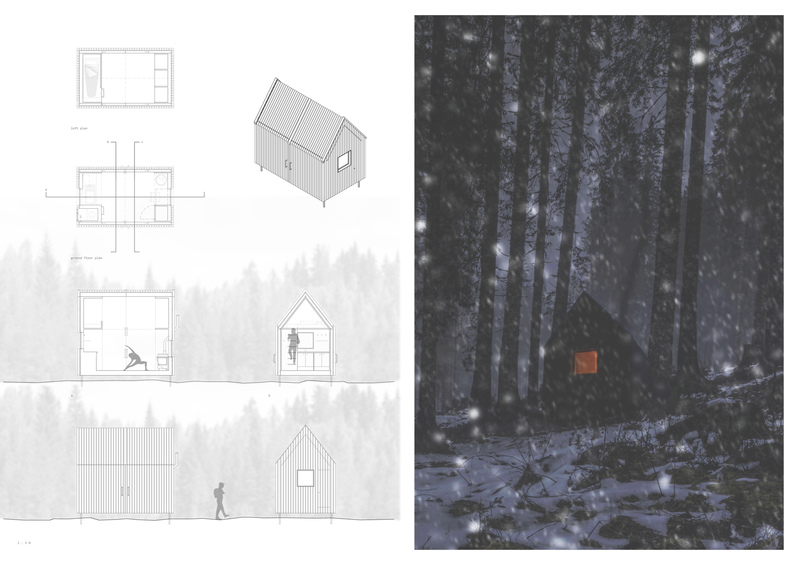 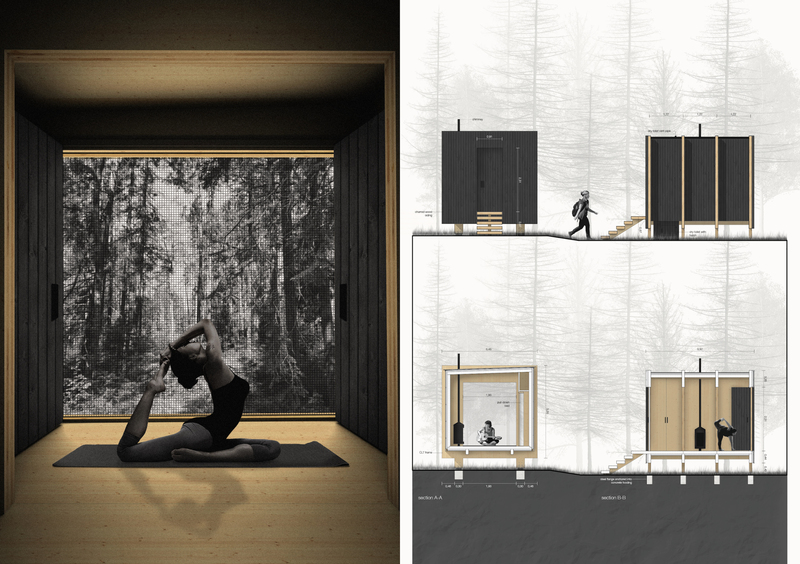 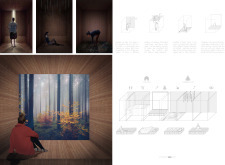 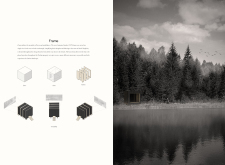 Silent Meditation Forest Cabins competition winners revealed! 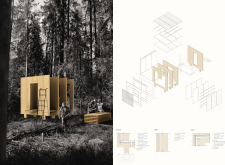 ‘Solo Cabin’ is an arrangement of 3 stacked spaces sized 2x2 meters and placed at various angles, a design decision which highlights the various layers of nature, allowing visitors to experience it from the forest floor to the branches of the tree canopy. 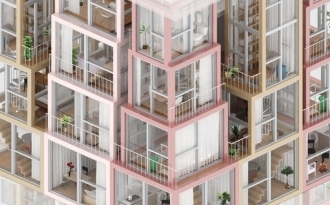 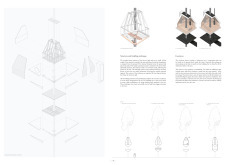 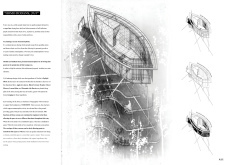 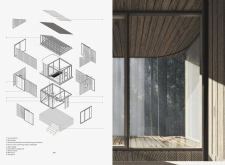 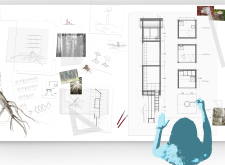 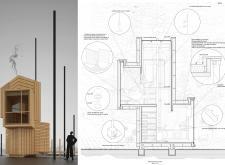 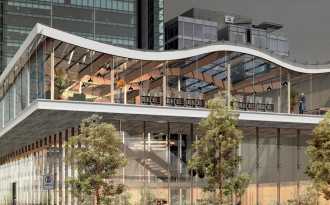 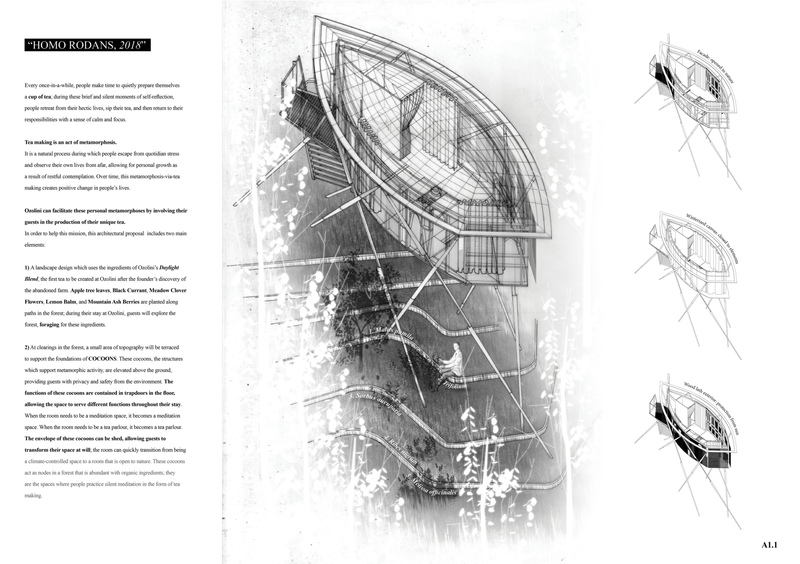 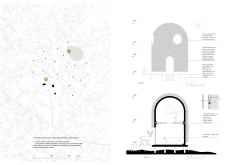 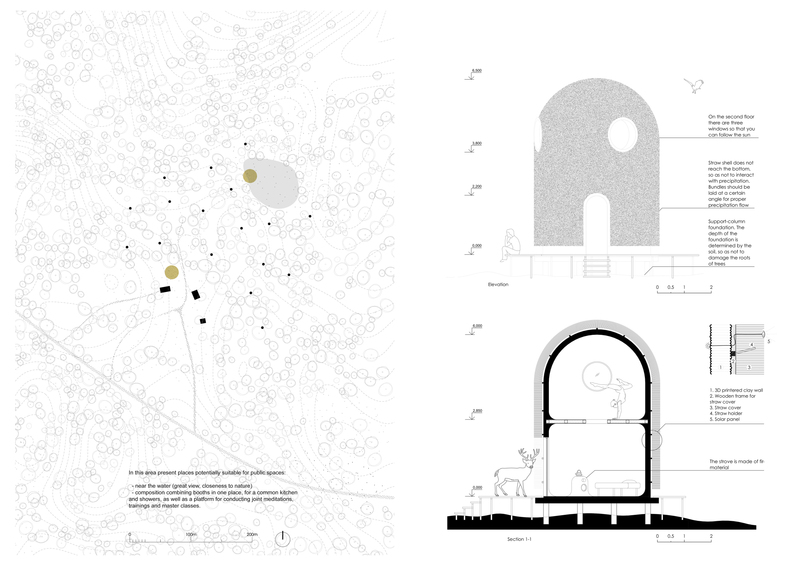 The submission includes a collection of drawings and renderings that are provocative, unique, and highly developed with advanced construction details. 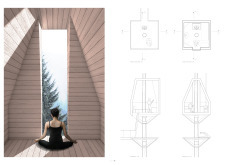 The structure is clad in wood planks juxtaposed perpendicularly, recalling techniques found in examples of traditional Latvian architecture; it is topped by a roof of polycarbonate sheets that bring in natural daylight from above. 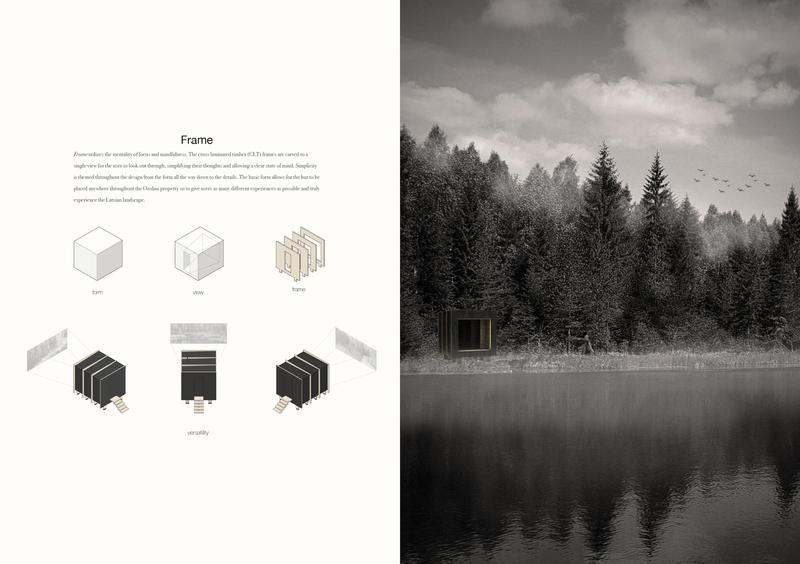 The opaque wood shell highlights the transparent stacked windows that protrude from it and provide focus points to various surrounding forest elements. 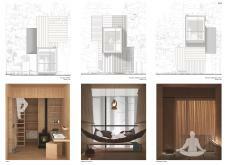 The jury questions the sole use of a hammock for sleeping, but otherwise finds the project and its graphic methods refreshing. 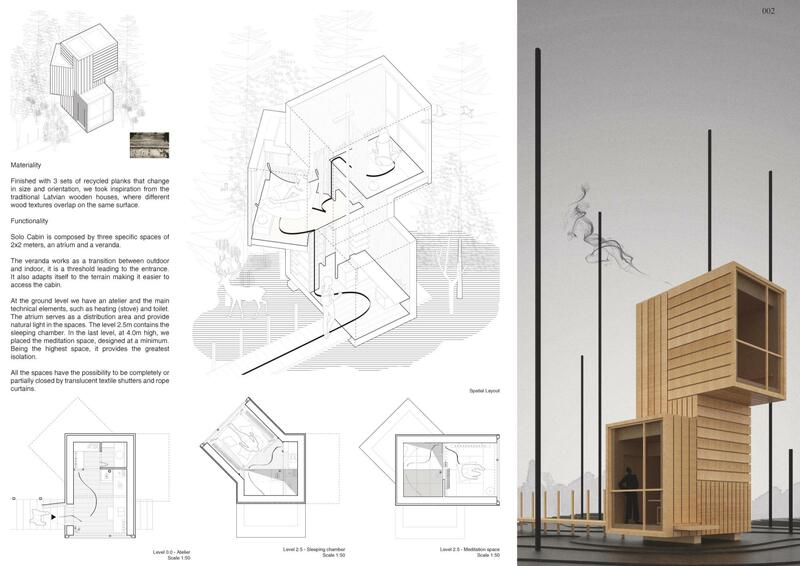 It is a design that could be readily built. 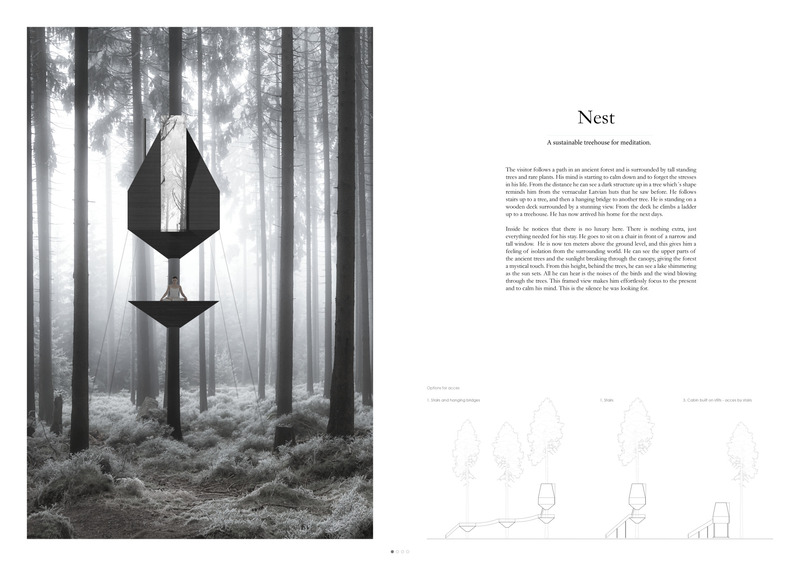 The ‘Nest’ is a meditative treehouse. 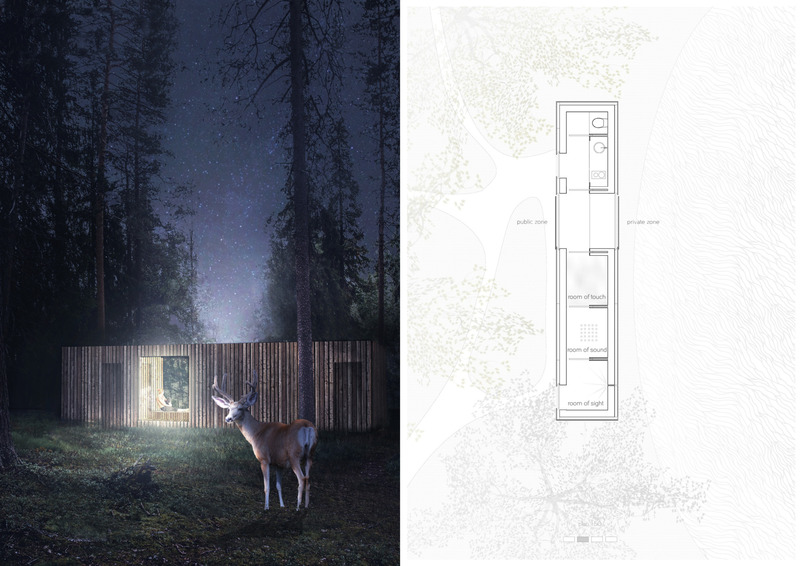 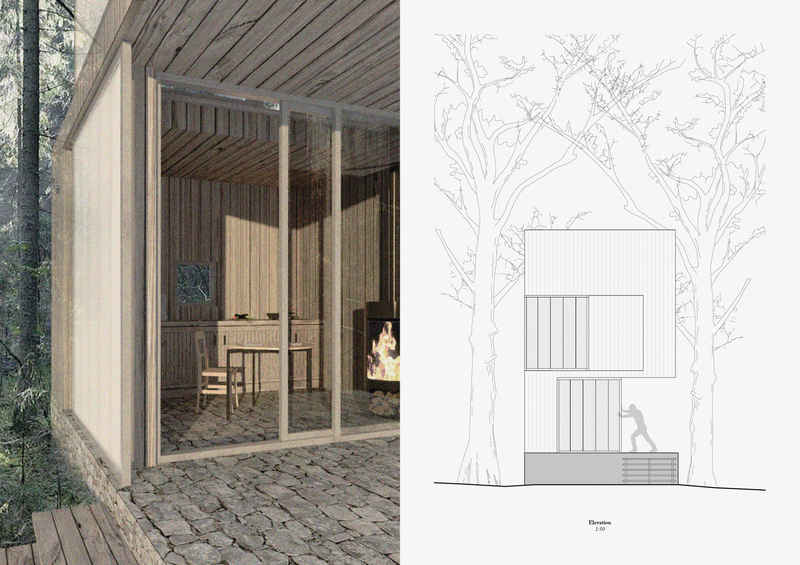 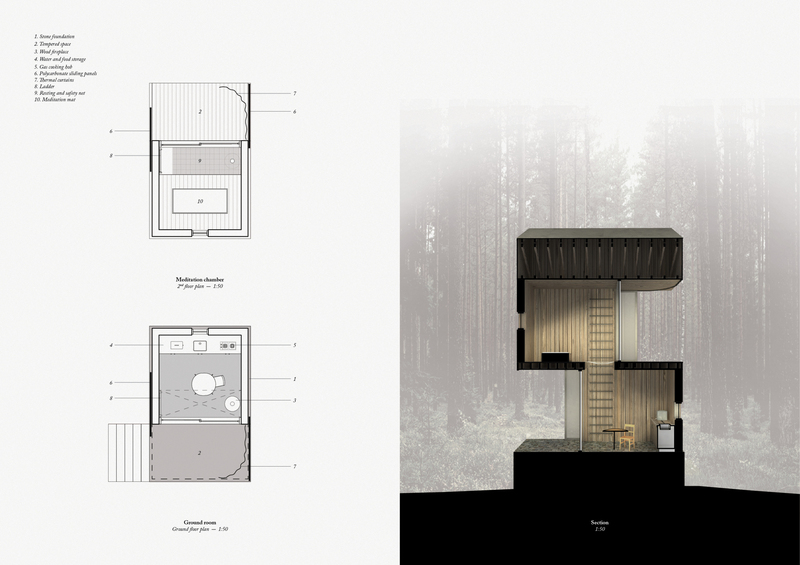 The jury was pleased with this submission’s use of the trees to provide a home to a meditative cabin isolated in a quiet space above the ground. 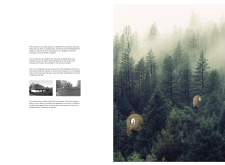 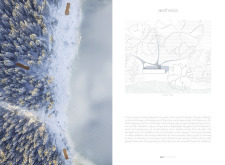 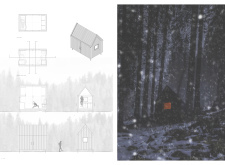 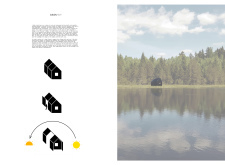 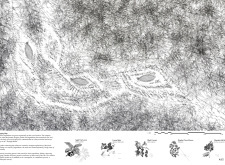 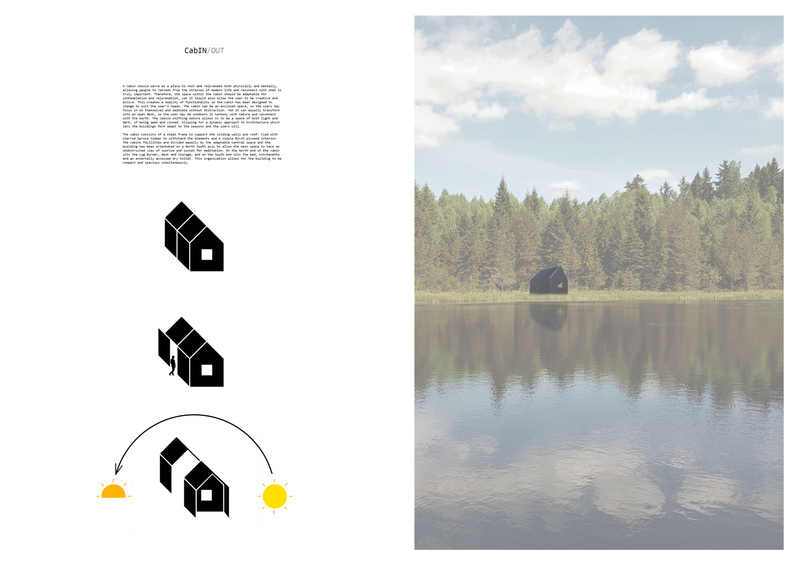 The project includes a detailed and captivating description of a visitor’s arrival to the forest, and his or her experience traveling to and entering the cabin. 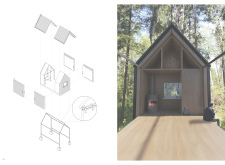 The design employs a charred-wood cladding that blends the cabin with the bark of the forest trees; this material also increases the cabin’s resistance to inclement weather and decay. 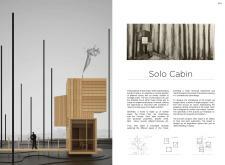 On the interior, a light spruce finish gives way to a warm space that is strikingly different from the exterior shell. 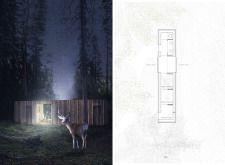 The project is decidedly spartan, providing little else than a protective enclosure to sleep within the forest, and it offers a single vertical window for observing the surroundings. 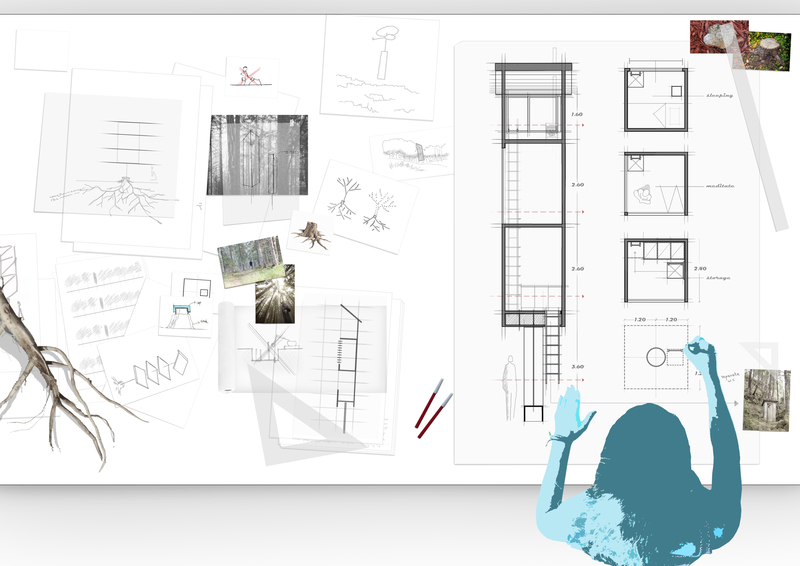 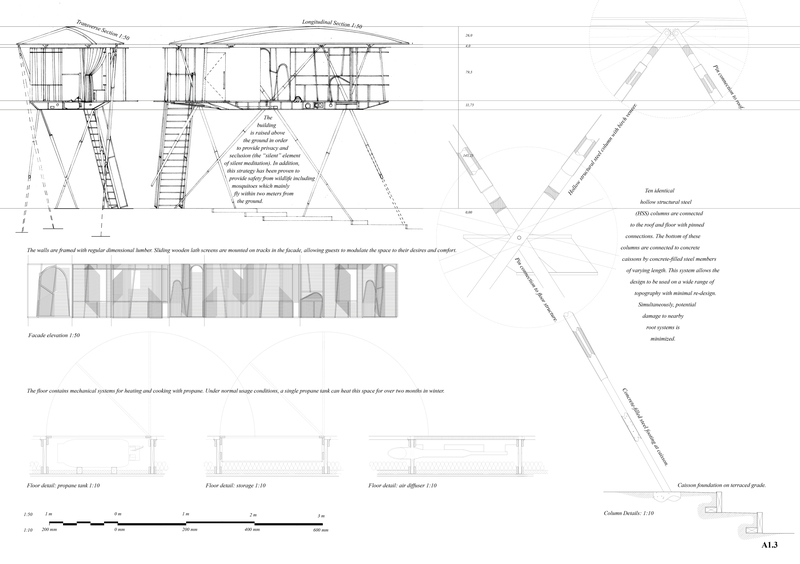 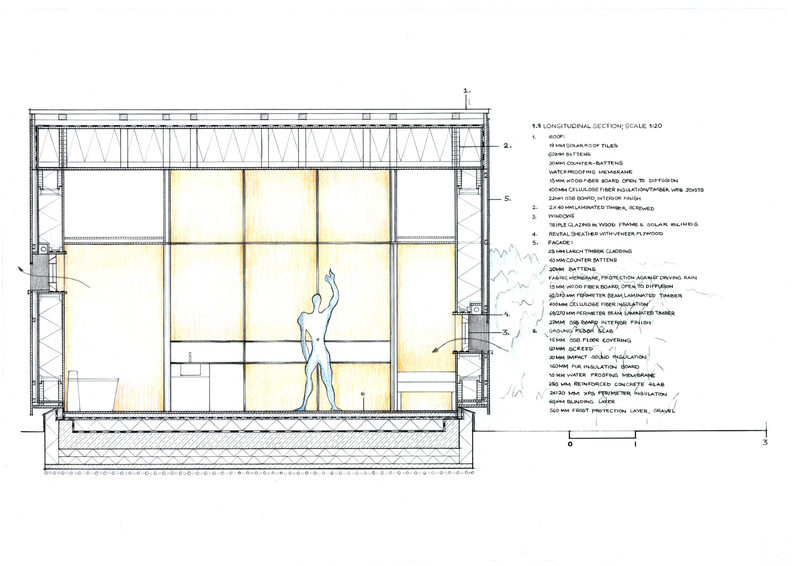 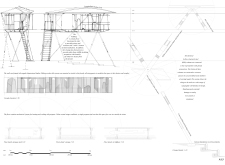 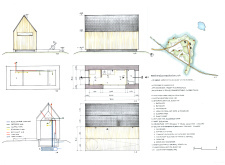 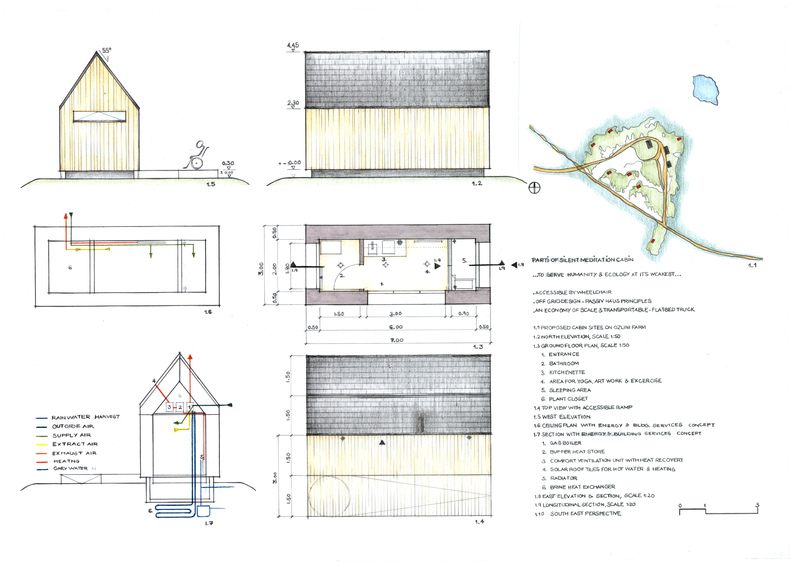 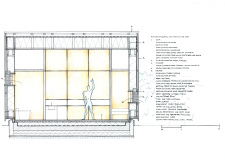 The drawings reflect the project’s simplicity. 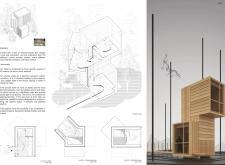 To consider construction, the details would need to be further advanced to include insulation and waterproofing. 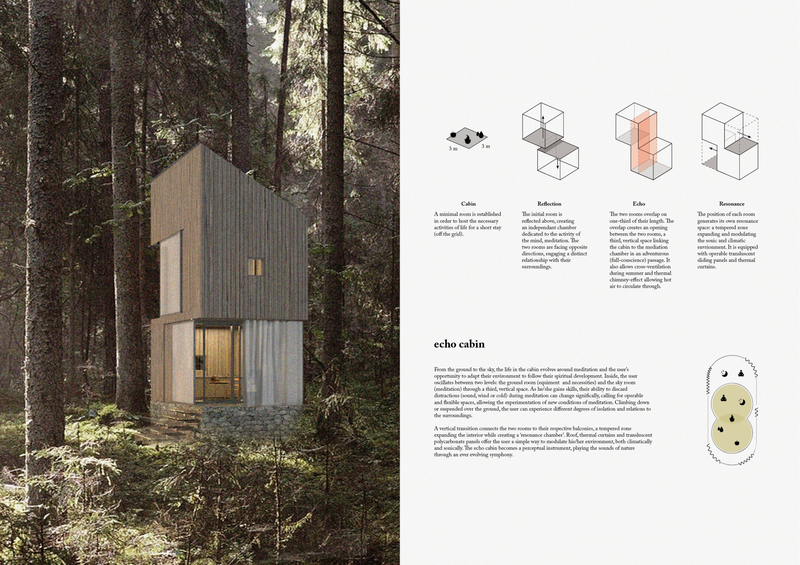 Nevertheless, the project is feasible and provides minimal disturbance to the forest. 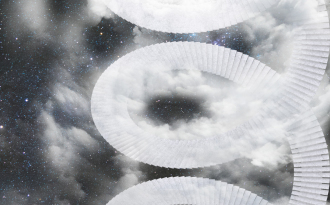 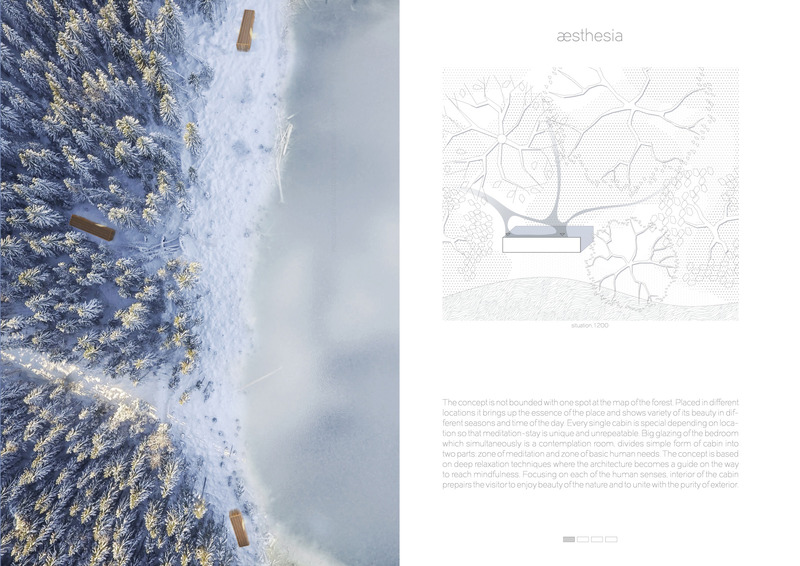 The project is entitled Aesthesia, a term representing the ability to experience sensation. 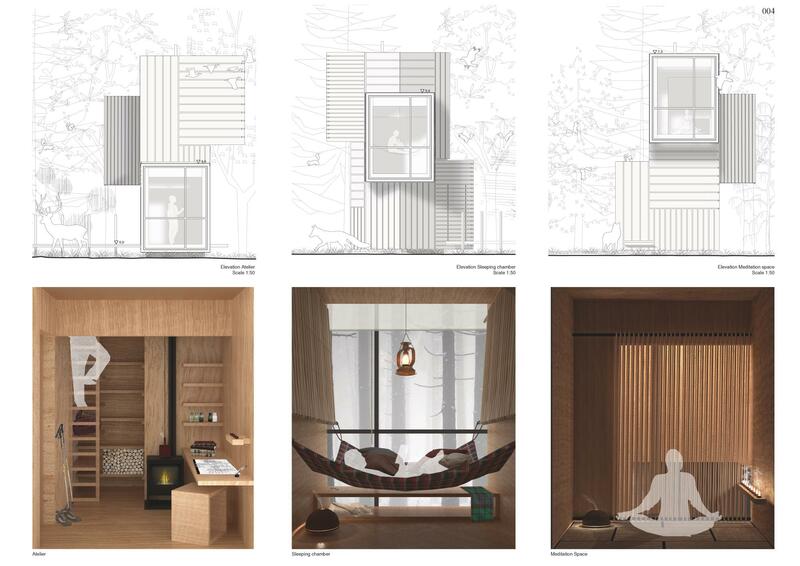 The proposed rectilinear constructions in this submission are comprised of rooms organized linearly according to the senses of touch, sight, and hearing; the designer describes this arrangement as ‘a guiding path to mindfulness’. 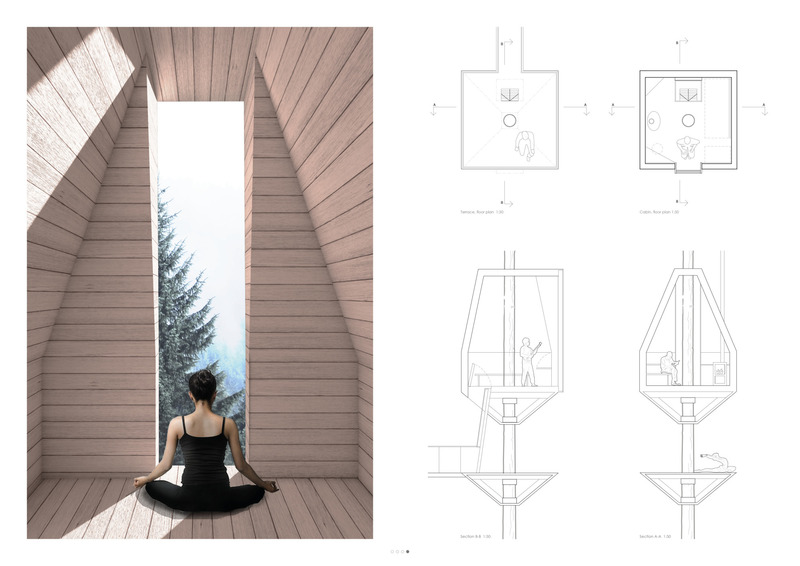 The typical block-form is divided into halves, one a zone of meditation, and the other a zone for the basic human needs of sleeping, eating, and using the toilet. 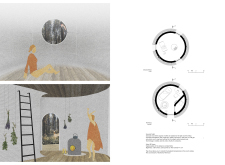 In each of the sensory spaces, an architectural element - a thin window, perforated metal pipes, textured floors - is employed to isolate and place focus on a particular sensation. 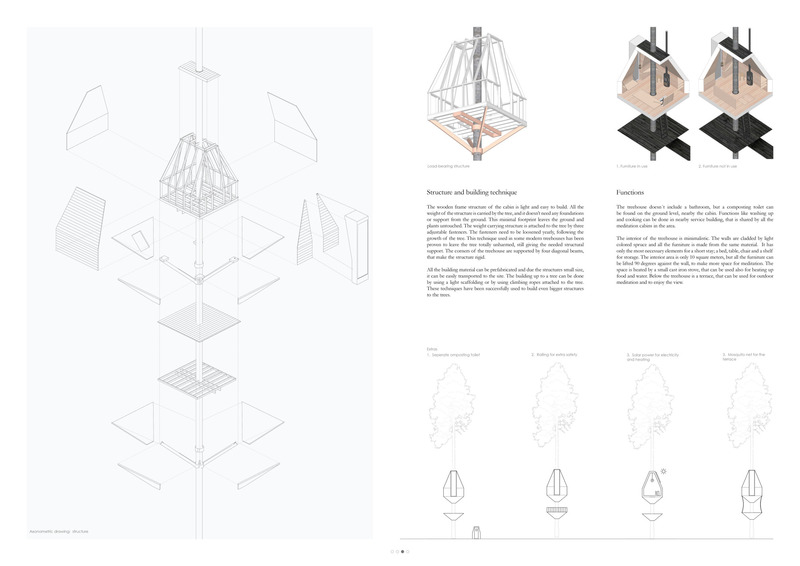 Through these means complexity is derived from an otherwise spatially simple design. The project is a clever and thoughtful response to the call for a meditative space within the forest.